Medical device design and development is a complex process rife with regulations, specifications, application requirements, and end user needs — all of which must be balanced and adhered to for a successful product. If your device lacks usability, market share will suffer, but if your device doesn’t meet regulatory guidelines, it won’t make it to the market at all. There’s much more that goes into designing, developing, and introducing a medical device to the market than simply coming up with an innovative idea, building your product, and offering it to the masses. The idea for new medical devices, like most new product innovations, often stems from the discovery of an unmet market need — in this case, products that can help people better monitor and manage their health, aid providers in improving care delivery, or devices that enable better treatment administration. These needs aren’t always obvious to the target user, as common problems are often regarded as inconveniences that must be tolerated — until someone envisions a way to solve it. Suddenly, an inconvenience becomes a solvable dilemma. However, many successful medical devices aren’t unique innovations. Sometimes, they’re improvements on established ideas; devices that can do what’s already been done but better, faster, or more accurately. Rather than focusing solely on bettering your competition or creating the next great innovation, you should pay attention to the market and focus on meeting needs. Identifying market need is merely the first step in a multi-faceted, complex process required to bring a medical device to the market, but it’s an imperative first step. 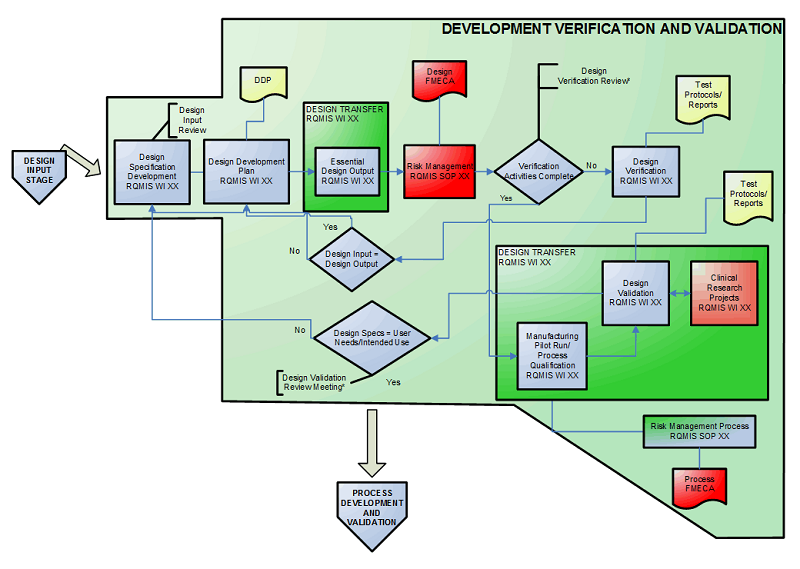 Much of the medical device design, development, and testing process is driven by regulatory standards. In the U.S., medical devices are regulated by the FDA, and these standards are largely in line with the international medical device standards issued by the International Organization for Standardization (ISO) and the International Electrotechnical Commission (IEC). Regulations are further influenced by the International Medical Device Regulators Forum (IMDRF), an organization consisting of national regulatory authorities aiming for the international convergence of international regulations, standards, and practices. While much progress has been made in this area, ultimately, regulation is handled on a national basis, and therefore differences may exist from one country to another, posing challenges for medical device manufacturers. The good news is that many national regulatory authorities are active participants in the IMDRF, contributing to the development of ISO and IEC standards, providing greater consistency in the regulatory landscape. Finally, the World Health Organization (WHO) serves as the coordinating and directing authority for health under the United Nations, with WHO experts contributing to ISO and IEC committees as a Category A liaison. In the U.S., all medical device manufacturers must demonstrate compliance with the FDA’s Quality System Regulations (QSR), which apply to not only medical devices but also to other FDA-regulated products, including food, drugs, and biologics in addition to devices. Also known as the Good Manufacturing Practice (cGMP) requirements, the QSR were updated in 1990 to include design controls authorized by the Safe Medical Devices Act. 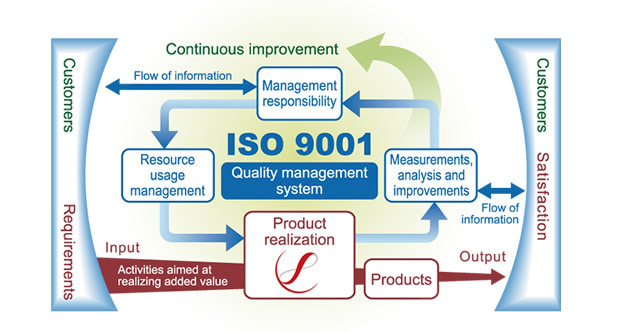 In order to create consistent requirements for quality systems, the FDA opted to update the International Organization for Standards (ISO) 9001:1994 “Quality Systems–Model for Quality Assurance in Design, Development, Production, Installation, and Servicing,” eventually resulting in the ISO/CD 13485 “Quality Systems–Medical Devices–Supplementary Requirements to ISO 9001,” which officially went into effect on June 1, 1997. Because of the broad spectrum of the medical device industry, it’s not practical for the FDA to prescribe how manufacturers should produce devices. Instead, the QSR serves as a framework for all manufacturers to follow, but manufacturers are tasked with following appropriate best practices, establishing suitable device requirements for safety and efficacy, and developing methods and procedures for design, production, and distribution of devices in line with the quality system requirements. In other words, the QSR outlines the end goal, but leaves creating the road map for getting there up to manufacturers. Do All Design Changes Require Design Control? Safety is always a priority in product design, but in medical device design, it’s imperative to ensure that devices meet functionality, reliability, and safety goals. 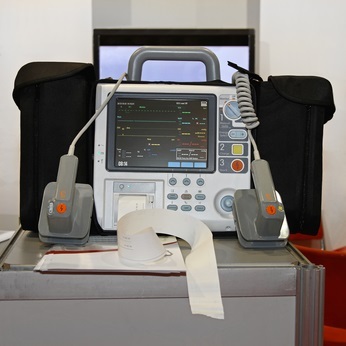 Medical devices run the gamut from simple health monitors to complex diagnostic and life-saving devices. In other words, patients’ lives can depend on the safety and efficacy of a single medical device. It’s a lot of weight on a medical device manufacturers’ shoulders — and that’s why continuous testing and iteration is one of the most vital components of medical device design and development. Medical device testing should validate and verify — to ensure that the needs of the end user are met and that the device does what it’s intended to do, as well as provide objective evidence that all requirements are satisfied. 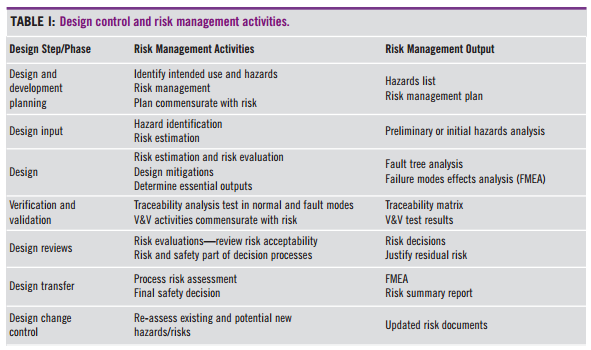 Again, the specific tests and evaluation design depends on the type of device being evaluated and the regulations, standards, and best practices that apply. While tests measure the validity of a device, testing methods should also be examined for validity, ensuring that the tests carried out are accurately measuring what they’re designed to measure. A test is worthless if it doesn’t provide an accurate picture of the target variable being tested (in this case, the specific functions of a device). What is test method validation (TMV) and what can it do for me? 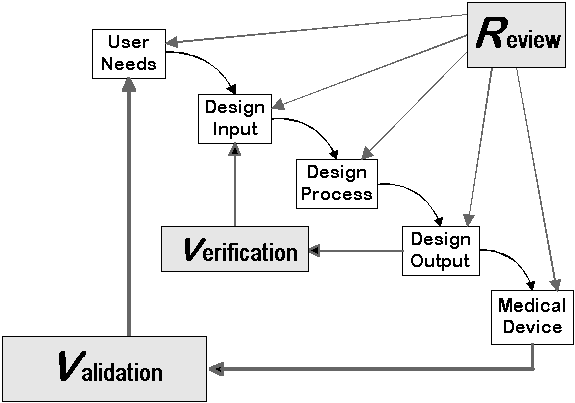 These requirements apply to all stages of medical device design and development, as well as the entire lifecycle of the device. An update to ISO 14971 is under development (ISO standards are reviewed, evaluated, and updated — if appropriate — every five years). The requirements established by ISO 13485 apply to organizations of all sizes and also to suppliers and other third-party organizations that provide components or services throughout the entire product lifecycle. In fact, the manufacturer is responsible for meeting ISO 13485 requirements regardless of whether a particular component was manufactured directly by the company or outsourced to a third-party engineering or development organization. Therefore, it’s crucial for manufacturers to carefully evaluate and choose partners, contractors, suppliers, and any other third-party entity equipped to comply with these and other applicable regulations, as the manufacturer is ultimately responsible for compliance. The following 13 resources include leading publications related to quality assurance and quality management as well as other valuable resources for establishing and maintaining a quality assurance program in accordance with applicable standards. Establish and maintain an overall Quality Management standard. There’s a great deal of pre-planning, process management, and ongoing testing and validation that goes into the design and development of every medical device on the market. That’s why it’s imperative to find valued partners knowledgeable about the various regulations and standards related to medical devices as well as industry best practices that can help you seamlessly navigate the design and development process for compliant, safe, and effective medical devices that can impact — or even save — patients’ lives. 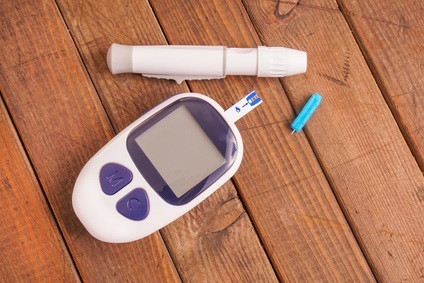 What are FDA Design Controls for Medical Device Manufacturers?